Julia’s Blog: Hey Sweet Pea, I Want That for You Too! “Dear Julia, I still don’t really know what you mean by “bowing to what is,” someone asked in a recent email. Maybe if you can imagine this conversation with Life. You: Dear Life, I want this really really badly. Life: Oh, sweet pea, how wonderful! It’s precisely what I want for you too. And because I do, here is what I think would be the best way to go about getting exactly what you want. Take the first right turn you come upon and just follow my directions along the way. You: Oh, Life, but I’m getting really tired of walking. C’mon Life, show me a shortcut, will you? Life: Believe me, I do understand that you’re looking for a shortcut, But a shortcut in your case, darlin girl, would mean you’d be shortchanged. You see that next sign on the road? It says DETOUR. Not DEAD END. Just follow it. Remember, when I say not now, I don’t mean NEVER. I mean not now. Or not yet. means trusting that at each level of having and wanting Life says: Great, you want this, I want that for you too, and this is what I want from you. Because I’m on your side and because I need your help just as much as you need mine. 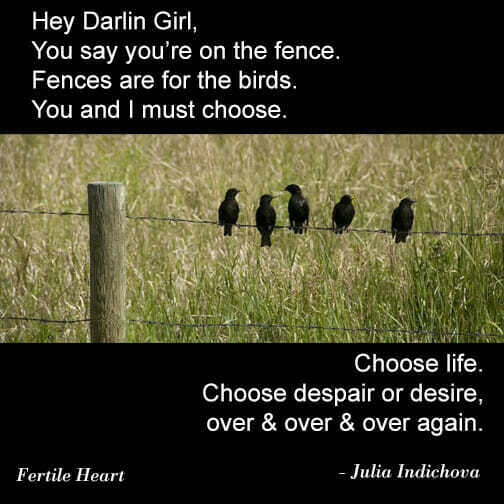 We can choose to bow, keep fighting with Life (Ultimate Mom) or keep choosing to follow Life’s directions. Anything interesting you’re called to bow to these days? On one of the last calls Julia was encouraging me to me to ask for what I need. Bowing to what is means accepting that I have unmet needs in my marriage and that I need to be a visionary (a grown up who takes action!) to communicate my needs. I finally began a dialogue with my husband about this over the weekend, and we are continuing our conversation later this week. 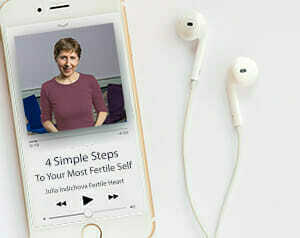 I remember reading in The Fertile Female that one of Julia’s clients realized that focusing on addressing something in her life was more important than getting pregnant. Her tearful quote as I recall was “that’s hard.” It’s hard for me to put the baby making aside and focus on connecting with my husband on a deeper level. It’s not that I’m not trying to get pregnant, I definitely am, but the FH work has shown me that my relationship needs attention. Our entire family deserves for this relationship to be strong. My husband and I are great at the day-to-day of life and co-parenting our son. Conflicting work schedules and parenting allow very little time together and that has taken its toll. We’re finally at a place where we can address those concerns now and hopefully that will make the baby-making process a little less more perfunctory and a lot more joyous. I don’t know if you remember but during our last call Julia mentioned the movie Joy. It was funny because my husband had just started watching this movie in a recent flight he took but couldn’t finish it. So we both watched it together and I loved it! It was very inspiring to me. A few days after I watched it I had a dream about a conversation between me and another friend. I was telling her how I felt I was spending my life only watching TV. We talked about an exercise I had to do (this didn’t happen) that consisted of me doing a list of 15 things I felt passionate about doing and that I couldn’t list anything that I might as well just write movies I wanted to watch. Then I went on saying that I once read our brains behave similarly when we are asleep than when we are watching TV. That TV doesn’t allow you to connect with yourself or with other people, and that I watched TV with my husband all the time. I told her I’ve been reading more and that at least I found that to be better because I felt I could connect with other author’s way of seeing life, to humanity, with the author itself. I don’t want to give any spoilers on the movie, which I also recommend, but it is so related. I also don’t agree that you cannot connect with anything watching TV, I’ve learned many things watching some documentaries and was inspired by a lot of movies like Joy before. But it is also true that it is a frequent resource I turn to when I want to numb my feelings, to disconnect when I want to connect. I do have many things I feel passionate about, I love music, I love to write and read, I love to cook, taking long walks with my husband. I just have to do this as often as possible. I always wanted to learn how to play an instrument, I love guitar, my father and others in my family play it so I just signed to a guitar class for the next couple of months a week ago. I am exited about that. I’ve been thinking and for me bowing to life would mean to live less room to my judgmental orphan, an orphan who labels people, feelings, situations, as good or bad. Trusting that every feeling, people, situation I encounter is there for a reason, to teach me something. I feel that when I am able to do this is because I am allowing myself to stay present for me and others, being open to whatever comes up, which feels like being open to live fully. I’ll try to work on that and let you know how it goes. Love to all of you! Dear Sparxy, I can really relate to your tater-tots-guilt orphans. I am constantly battling this all-or-nothing notion, the idea that I don’t get a baby because I am not perfect. And while I am so forgiving to the failings of people around me, I am so non-lovingly demanding perfection from myself. For the past two months my period was strange – once it came too soon, and once so late that I worried it will never come again and I have entered menopause. When I friend remarked that “you are not happy when it comes, and you are not happy when it doesn’t come”, it dawned on me that I am stuck in the old-age orphan land again (I am 42). In moments like this I try to remember that continuing walking is what matters most and as Julia said faith comes with the practice, not the other way around. I love reading all of your comments. I learn so much from the Fertile Heart community. I am bowing right now to so many things but I honestly don’t have the energy to write that much (so I’m also bowing to that and not listening to the Orphan who says I should). My Visionary knows I need to find the time for my imagery exercises and sleep tonight. I’m bowing to the fact that I missed the last call because my dad was in the hospital. I had to deal with some Orphan relations and respond in a more Visionary way. It has been an emotional time for me and my family. I am bowing to the situation and handling it better than I thought i originally would. I am bowing to the fact that work has been very stressful and the school year is drawing to a close soon, not only for my daughter but also for myself. I am a teacher and find this time of year bitter sweet. But I’m bowing to the present moment and not counting how many days there are left for this or that, especially after the situation with my father. It was a blessing because it is a learning lesson not to take time for granted. My Visionary is showing me to slow down and focus on today. I love how Julia showed the translation of our stressors. I keep telling myself over and over that I am blessed with a job, even though it may not be the best one out there, it is providing for my family. I was given an assignment this year that was very overwhelming but I managed to learn a few things through the process and saw it to completion. I have to say I find it interesting that a few fertile heart mamas are teachers. I love reading the comments, too. It makes me feel very comforted and surrounded by fellow warriors. It is amazing how similar our feelings can be. PeacefulWarrior, I’m sorry you are going through a health issue with your dad. I know what that’s like. Just a year ago this weekend we faced my mom’s health crisis. It’s bringing up a lot of orphans in me again. Too many to count. Hugs to you as you go through this. I related so much to your comments. I am bowing to the present moment of today. I had a conversation with a patient who shared with me on how she was diagnosed. She said she had a dream and her parents who were deceased came to her in the dream. She was in her house and her parents came in and said “follow us outside and bring a blanket”. She went out of the house with the blanket and they were standing there over a deer that had passed away. They covered the deer with the blanket. Then in the dream they told her: go to the doctor go to the doctor go to the doctor. She went to the doctor right away and that is how she was diagnosed. It made me think of our work in the FH community and dream read. It also just gives me more proof how our minds and bodies work and how much we really do not know in the medical community. Also sadly I had an aunt just pass away. I will be going home for her funeral. I may not be able to make our next call b/c of it but waiting on final details. I have missed everyone’s voice. I have been thinking of life and death alot – I guess curse of working in oncology. I just get to see daily what a gift our lives our and what we can do to make them better for ourselves and for other people. I heard one of the doctors I work with say something beautiful about having children: “it is a wonderful experience having children. You get to show them the world and what you enjoy. You also get to see the world through their eyes and experience it’s beauty again”. Why do I want to be a mother? So I can share my life and loves and beliefs and experiences with my child. I love to do these things with my husband and sharing with a child would be a wonderful dream come true. Dear gutsymama, I am so sorry about your aunt. You know, an aunt died last January and today it would be her birthday. We were talking about this in a chat I have with my family and mentioned I dreamed about her two days ago. Two cousins and another aunt said they did too. I don’t remember dreaming about her before, I just thought this was very beautiful. Lots of love for you and your family! My periods have all but stopped since Christmas. I am bowing to that by seeking medical advice, and taking care of my body. Not running away with assumptions but working with what I know now, and facing (however scared I am) what I still need to find out. Believe me it is taking some orphan hand holding. I have recently met someone who has provoked a huge emotional response in me. I am bowing to that by allowing the feelings to come to the surface and be with the inevitable questions that they bring. I am bowing to time. I so desperately want the “home” I have imagined for so long. But the home of my imaginings is a calm place where things are allowed to unfold, and pressures from others are kept at bay, and I am bowing to it being that kind of space long before I get there. Finally I am bowing to uncertainty over what I want in the future for my marriage. How could it be otherwise right now? I am bowing to living the questions every day. It helps to remember that I am growing as a person every day, and this blog has really inspired me to take my time so that there is more of a chance that I will notice life’s guidance. Julia, wonderful blog and fantastic translations and Mila, that conversation with Life sounds familiar. Butterflyfaith, in some ways I could have written this about “stressors” but mine would be somewhat different. HarmoniousLife, yay to bowing and Annabell,yay for building a home with your husband – how exciting! Heather1975teaching I am immensely enjoying the translations as well. I have been doing an imagery of having plenty of time and body truth of what would it feel like to move in a certain way. Julia, the translations are just what I needed. My orphans were definitely in charge a couple of days ago – I was feeling definite “stressors”. Minimal sleep I’m sure played a role – my daughter had awakened me in the night 3 out of 4 nights (and not for any emergency either). So After reading the translations for butterflyfaith I decided to give the translations a try. On the left side of the paper I listed what I thought were my “stressors” of the moment. On the right I listed the translation. My orphans were really resistant about doing this. They said things like – I have a right to be angry – those other people are being unreasonable. Why should I alter my view? I started with the easier translations first. One of the hardest was related to my daughter. The translation was something like God blessed us with this very hard to raise child because He knew we would come through it and have amazing parenting skills in our toolbox for whoever might come along. He also knew it was not more than we could handle and that we would gain amazing empathy for kids whose beginnings or current circumstances are not ideal and the parents raising them. As a former teacher I have also been taught to milk every possible learning option (well it seems like it). Also, related to Julia saying that predicting the future is an orphan and that if we say we will not be happy without a child or without another child and will be happy with that child, this is an orphan. My daughter’s dance teacher owns her own successful studio – has 3 children – 2 girls, one boy – the ideal life. This teacher confided to me the other day that she had to take her dance star daughter (who was getting leads int the performances) to Mayo Clinic to see what is wrong and if they can do anything about it – the mother explained it to me as being allergic to air? and she needs 6 hip surgeries and has had many life-threatening symptoms. So we go from ideal life to extremely challenged life in one short year. The mom is strong in faith, but I’m sure at this moment it is not easy. Just reread this lovely blog again and it is helping my orphan to take gentle breath. Sometimes it amazes me how I can read something Julia writes and find something new to my eyes and heart each time. It’s a guide post on my path and I’m grateful for it! for the bowing, life-chooser Visionary in us the sign ALWAYS reads DETOUR. The view from her window doesn’t change with the weather. As a humble but reasonably confident teacher who has walked alongside of you for a while, I’d say you may need this practice to allow you to recognize which glasses you’re wearing not what the sign says. Because the glasses you wear distort everything. It doesn’t matter what the signs say, you will only be able to see your own version of the text on every sign. Julia, you are so right. I sometimes feel I have had laser surgery on my eyes to permanently implant orphan glasses. It seems so foreign to me that, as you said, “the view from her window doesn’t change with the weather.” I love this and I want to embrace it. Because most of the time, I feel my moods and attitudes change completely based on what is going on with my life. Got my period early? Depressed. Got a health scare? Panicked. Got a great ovulation? Euphoric. Now I see this as an orphan way of living, so it’s time to change that. Love this insight. Hi everyone – I read Butterfly’s post below and really identified with it. I have so many of the same feelings and also just as she so articulately says – “I’ve done all this, so why don’t I have a baby?”. That is so where I’m at right now. Having a big ol’ pity party for myself. Like I said on the call last week, I had these like three weeks where I just put that self-pity aside and was feeling so good. And then I started my period, Mother’s Day happened and I’m back to where I started, which makes me feel even worse because I actually felt like I was moving forward, moving with the current of life. But something I’m struggling with – how do I balance appreciating and receiving the abundant gifts around me while at the same time challenging myself to work on my practice? I don’t know if I’m really explaining myself well, but an example – I was with a friend on Saturday night and we had a great time. But I ate tater tots and then I guess I kind of ruined my night by spending a lot of time and energy worrying about those tater tots and my fertility. If I hadn’t worried about that, I would have had a great time. But is eating those tots failing? Was it ok to let go for that evening and have fun and laugh and eat tater tots? I just don’t know and I feel like I am driving myself a little crazy with all this second-guessing. It’s something I’ve done all my life. I am just unable to relax in the moment and also am riddled with doubts about everything I decide. And unfortunately, I have twisted my practice to fit in with that paradigm. I think I may have lost my way a bit. Any thoughts on this from my Visionary Mamas? Me: So if I do all the things you ask me to do, if I work hard and am strict with my diet, my exercise, my FH practice – will I get a baby as a reward? Life: You will get many gifts on this journey. Me: I don’t want gifts, I want a baby! Life: Let’s hold hands and walk into the unknown, shall we? To bow to what is for me is to trust Life and walk into the unknown with eyes wide open for all the gifts that come along. Oh my goodness! This is perfect. I feel like I need to bow to just about everything right now. I have the normal stressors of May (end of the school year, summer, time passing so quickly, kids growing up too fast, final grades need to be submitted, husband working overtime) along with the special nuances of this year (mom’s one-year anniversary, my son graduating preschool, big fat birthday coming up too soon). It’s all been so overwhelming and anxiety-provoking. For all of this, I thank you Mamas and my Mentor Mama Julia for giving me the time and space on the call Monday night. I needed that, and I thank you all for hanging in there overtime and working with me. It’s been a rough ride lately, and it’s made tougher because I didn’t realize it was that rough. I ignored my orphans until they punched me in the gut. I knew I had “anger and bitterness issues” but I really never identified that as a clear orphan before. So yes, I must learn to bow to this revelation, and then figure out how to mother her instead of ignore her and let her deal with things on her own. I’m bowing to my body, too, because this month has been a very strange cycle. Confusing ovulation, possibly early ovulation, shorter period, and a TON of obsession about all of it on my part. Hmmm, sounds Visionary, right? Suuuuure it does. ha ha. The fact that I’ve been setting myself up for stress this month, telling myself for ages that “May and June are going to be rough months” I’m *sure* did nothing to whack my hormones out of balance. ha ha. Yet my orphans are screaming at me that this is the first step off the cliff of menopause and it’s all starting. Say goodbye to balanced hormones and 28-day cycles and lovely ovulation times. Nope. Now it’s irregular periods, perimenopause and hormone hell. And NO baby. And yet I wonder why I’m feeling so fried? Now I’m going to bow to my body, bow to my fears and stop trying to control every cell I own. I also had an appointment with a fertility doc (my third) next week and I’m debating keeping it right now, especially with my anxiety and stress. (Whoa—see what I did there? I used past tense. Hmm, maybe I’ve already made up my mind??). Honestly, I don’t want to hear any more statistics or anything of the sort, especially because I fear my body is reacting exactly the way the docs predicted it would as soon as I hit 45. I don’t feel very Visionary and I’m not sure who will be at the consult–me or my orphans. So I’m going to bow to that too. As you know I’m far from a “positive thinker” or a lover of platitudes. It’s important for us to honor our “temporary, orphan rooted, distorted truths.” But in this lovely practice or ours, we aim to see them for what they are as opposed to present them (to ourselves mostly) as a reality. I have the incredible blessings of May to gratefully receive. I get to celebrate the fruits of another school year in which my 2 children got to go to a school with a caring staff and other well fed, well taken care of children. The blessing of seeing my children flourish and grow. The blessing of enjoying my role as a talented, skilled teacher who rewards her students with an expression of caring through the grades she gives them. The blessing of a brilliant responsible healthy, loving husband who is gainfully employed and can provide for his family. A blessing to celebrate another birthday surrounded by so much love and plentitude. Oh, my, all the goodness in my life. It’s all been so overwhelmingly beautiful, evoking boundless love and gratitude. I could go on, but I’ll let you complete that translation. I’m sure you’d know just how to go about it. Sending your “stressed out” Orphan lots of compassion and peace and Yes! to tending to her. What a beautiful idea…to translate…I am borrowing this dearest Julia and butterfly and I hope you don’t mind. I have had a phrase you mentioned in your teachings Julia about feeling a wave of gratitude wash over me when I feel otherwise ( terrible paraphrasing I know) as a tool and this fit right in my tool box. Sending you lots of love and healing, Butterfly Faith! Your name includes the word Faith. Tap into it! Think of the time when you chose it. It may provide you more healing. This week’s homework on the intro series Julia asked us to read the Celestial Gravity. I was reading it just now on the subway this morning. I landed on the paragraph that explains what it means to ‘bow to what is’. Beautiful chapter. Perhaps I will go back to reading it now. Thank you HL and Heather. I feel less lost knowing my friends have my back. HL, great idea about that chapter. I’m going to read it tonight before bed. Thanks for that! Oh Julia! What would I do without you?? Don’t make me find out. ;-) Thank you so much for this. It means the world to me. And it makes SO MUCH SENSE! I love how you can say something and the lightbulb goes off for me. You are so right. I’m only looking at May and June as these scary milestones instead of seeing the flip side of the same coin. It’s like earlier today I was griping because I had so much laundry to put away. But then I realized I have so much laundry to put away because I have so many clothes and my kids have so many clothes (most of which were given to us by friends after their kids outgrew them). Blessings by the truckload! What a blessing you are to me and the group, Julia. I find myself responding in similar ways to the other Mamas, often thinking “I’ve done a lot so where’s my baby?” But I’m trying hard to now see what all that doing has gotten me. Maybe not a baby, but a wonderful practice, a chance to meet other Mamas, the opportunity to stretch myself in new ways beyond the conventional “norm” and a beautiful mentor relationship with you. So yes, I think I like this translation practice. Very much. Love to you and the other Mamas. Oh, I love this. And what I’ve learnt is that the times I am able to take this approach, and to trust that Life wants for me what I want, and that it’s on my side, and not being mean to me (as my orphans will have me believe), then EVERYTHING feels different. My life goes from feeling like a big unfair struggle to being a beautiful and neccesary journey. These last few months I’ve being called to bow to the the fact that the disappointment of not being pregnant yet has meant that I’ve finally been able to build a home with my husband. You see, until last autumn, despite being together over 5 years, we’d never properly lived together as he’d been working abroad (and for various reasons it made sense for me to stay in the UK and for us to see one another at weekends). And of course, had I got pregnant during that time we’d have made it work. But it has been very special having him back, building a proper life here together, seeing that we do live beautifully together. And now having that as the stable ground onto which our child will hopefully someday start its life. Thank you for the wonderful blog, Julia. That’s a good question, what does that scenic route mean? That sounds like a good idea, heather1975teaching, letting your body child set the pace. Right now I feel I need to bow to having a lot of tasks to do. It kind of makes me angry because I would rather be spending time I need for me. I decided to visualize having lots of time for my imagery this week and continuing on with seeing how it would feel to move my body in a certain way. I just feel I need to be at peace with the many tasks I’m looking at. Visualizing having lots of time has been very calming (kind of like a mini Mosaic of Revelation). It’s amazing how these blogs always seem to manifest when I need them the most!I have been thinking about a lot about time these past few days and how I want to be able to bend it to my desire. Sometimes it’s a struggle to be patient and still. There’s a passage in the fertile female when you remark on a woman who lets her child set the pace of walking and it hits me that I need to let my body child set the pace and not my panic orphan determine it.